This particular painting’s origins were different than all of the others… All of my previous paintings began as images in my head. But this one was different – I knew that I had to have a beautiful Indian woman in my series. However, I had almost zero experience with the Indian culture, and could not see a clear image in my head. Turning to my Indian friends, they helped me create an image that not only would be beautiful, but also understandable and representative of the Indian culture I so adore. This painting is a symbol of all Indians, their beauty, their rich traditions, and especially their faith. One friend of mine, Margaret, taught me the best way Indians show respect to their elders. She explained that they bend down and touch the feet of the elder, and in turn the elder puts his hands upon his or her head. This is a way of receiving an elder’s blessing – acquiring intellect, knowledge, strength and acceptance towards progression. 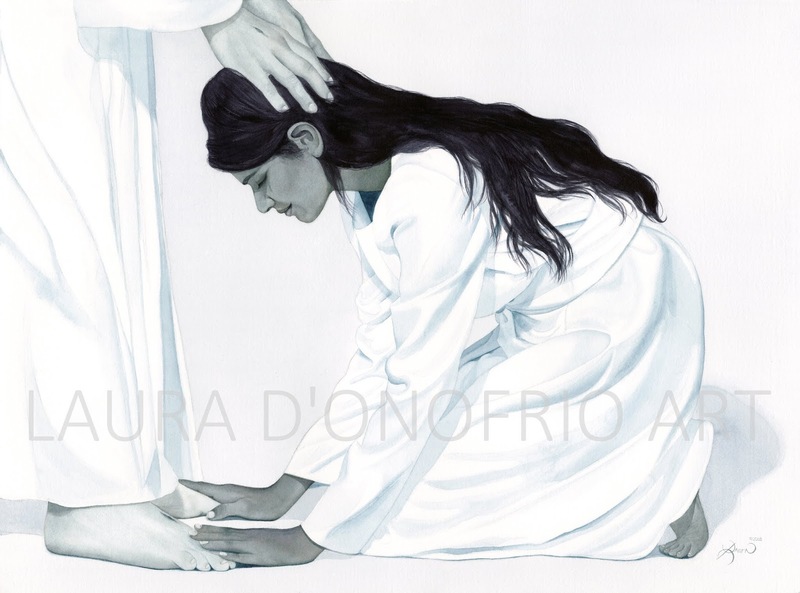 Brides will kneel down before their fathers, prior to their marriage, in order to receive these blessings. When Indians bend down to touch the feet of their elders, they are surrendering all their ego at the feet of the elder. So when a Hindu woman meets Christ for the first time in heaven, it would make complete sense for her to show respect in this same way to her Lord. Another friend, Doris, helped me name this piece in order to effectively translate to the Indian people my message. Doris felt the best title should be “Oh Lord, my God” (pronounced “Hay Mayreh Prahbu” in Hindi). Unfamiliar with the culture, I was worried this title would be offensive to a Hindu, but she explained to me what “Lord” means in India. There is a clear patriarchal system in the Indian culture, where the woman’s husband is considered closest to God. The wife will call her husband “Lord,” as a form of deep respect for his position as patriarch and his closeness with the divine. To say “Oh Lord my God” to Christ, is a sign of sincere gratitude for her completed life, and all that it held for her. In Hinduism there are over one hundred Gods that they know and worship. Hindus see Christianity as a faith that worships Christ, who is a God, and they do accept this whole heartedly. The one thing this woman in the painting does not yet know, however, is that Heavenly Father is the Father of all creation. Christ touching her head is a symbol of allowing this woman to progress forward on her spiritual journey. Christ is the prince of peace, and it was important that my painting showed the peace she felt while in the Savior’s presence. Now that I had a better understanding, and an image respectful of the cultural context, I could put this painting together for the world to love. Every time I complete a piece, I say to myself. “This one must be my favorite!” I suppose this is my new favorite! There is so much love in this painting! A friend of mine who is not religious said she felt this peace radiating out of it, which is a wonderful complement! I know beyond a doubt that God is the Father of all, and Jesus Christ is the savior of EVERYONE, including this gorgeous Hindu woman, whom He understands far more than I ever will. My hope is that the Indian people will see this painting and know that Jesus loves them deeply, and that Christ offers a way of progression in their spirituality that is intimate and dear. This painting is my gift to all of them. Thank you to the gorgeous Mounika, whom I found through a friend-of-a-friend when I was searching far and wide for the perfect model that would best fit this piece. Mounika, you were beyond perfect, a real miracle brought to me! Thank you to Margaret and Doris for their insight in helping me understand and communicate the message of this painting. Thank you to Karin, who still believes whole heatedly in my series and has watched my little Sofie so I could get another painting finished. Thank you to Brent, who has always been my Jesus hands and feet. And of course thank you to the talented Christine Simmons, who is my eyes so that I can bring these pieces to life. Through all of you I was able to create “Oh Lord, My God,” And it couldn’t have been done without the much appreciated support and help from each one of you! To all of you who are reading this, I wish you peace. I wish you profound love in your life. And I wish you joy, from my heart to yours. As they say in India, Namaste.